I find it sad that people assume they will never be a book that they will enjoy. I can't imagine not reading, and I would rather pick up a book then turn on the tv. Reading books is quiet. Solitude and silence in a noisy world. I've always been an avid reader. I've never been much of a TV watcher, and when I do turn it on I watch channels like History, Nat Geo, Animal Planet, Discover, etc. My TBR pile is ever growing, and I couldn't be happier! There are so many amazing books out there. Reading is my happy, my calm. Ahh, love this post! You captured well a lot of the reasons I love reading. I even used to prefer text-based role playing games to the flashy graphic ones, because I liked imagining everything in my own mind better than seeing what someone else's mind had come up with. I think a rich life has room for all sorts of entertainment. As much as I love reading, I don't think it would be "better" (or healthy) if that's ALL someone did. It's important to go out and DO things too, not just imagine them. First of all, I love that arch of books over that doorway. It's giving me some ideas. Secondly, how do you know that more and more people are choosing television over books? I think people have this idea that a hundred years ago, everyone was reading books for entertainment, and television has ruined all that. Not true. Literacy was much lower then than now, so in actuality, more people are capable of reading now and therefore do. Also, the numbers I've managed to find that breakdown book sales by year show that each decade (including the past one) book sales have increased. At worst, they're staying steady now. The fact that book STORES are going out of business does not mean that books aren't selling. It only means that people are buying them other ways. Mrs. Q and Angelina: I agree! Courtney: Love the National Geographic channel! Kristan: Don't get me wrong. I love movies and TV too! Sonje: I've found government studies that say the percentage of 17-year-old non-readers has doubled over the last twenty years. Another says the average American young adult spends 2 hours a day watching TV, and only spends 7 minutes of their daily leisure time on reading. More people may be literate, but that doesn't mean they're reading books for pleasure on a regular basis. 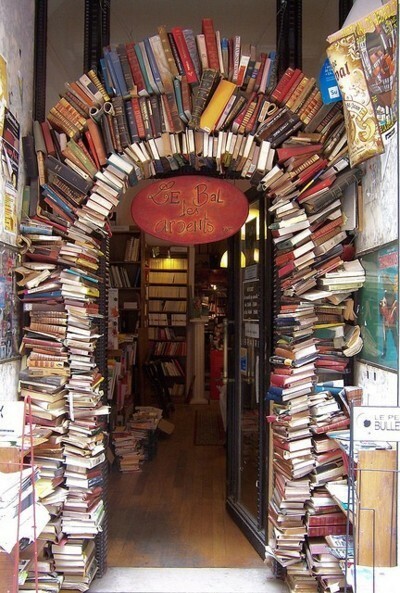 Oh, and I love that arch of books too! 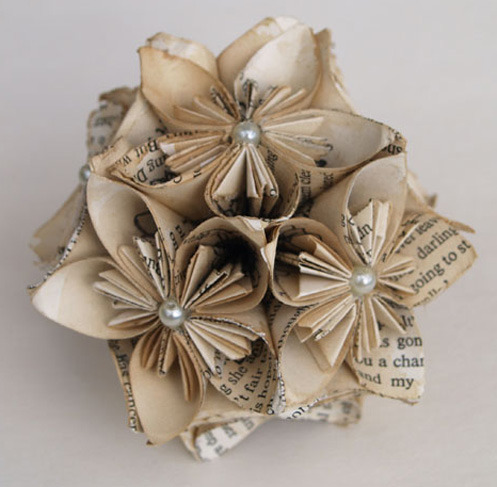 I have a fascination with sculptures made out of books and paper. Oh my god, I am in love with that archway. I love exploring the possibilities of things I might never have dreamed of. I love imagining the ins and outs of a setting; HP was a fantastic read for this. This is partially why I have such a difficult time with movie adaptations; I have such a vivid mental picture that it's difficult for things to match how I'd imagined them. There's leeway, of course. I love the potential of TV, too, as there are some shows (Babylon 5, Lost) that are *great* stories, but the visual element plus casting just made all of the difference. Different stories for different mediums. I feel like I'm babbling, but, I love the discussion. I have been an avid reader for as long as I can remember. Unfortunately, I know more people (in person) these days that refuse to read than people that will read even one single book a year. Thankfully, there is the internet. In the few months that I have been using it I have found websites like Goodreads to browse new books, Tumblr where I actually feel like I fit in with the crowd and can post about books without people yelling at me, and blogspot where I can talk about nothing but books and be completely accepted for it. Using the internet HAS cut down on my reading time though. I've been making it a habit for the past couple of years to read the book before I watch the movie, even if it is an older one, and if I have already seen the movie without first knowing it was a book, I still plan on reading them to get the fuller picture. I've never been much of a tv watcher, though.